Today I am describing basic reading mechanics, as you teach your budding reader. I hope this is helpful! This is a little different than what I have been sharing with you, but it’s still early in the academic year and may be what you are looking for. Emerging readers begin in a print awareness stage. Littles recognize that thought can be written, they look at print- the letters, spaces between words, how to handle books and recognize what a word is. Eye stop: Eyes stop briefly (fixation) then move to another stop. This is when recognition happens. It’s instantaneous. Eye span: The span is the amount of type seen in each eye stop. Regressions: This is a habit of going backward and re-reading. Eye teaming: Eyes work together to read. Watch for squinting. Eye-hand coordination: Eyes and hands work together. Visual perception: Perceptual part of the reading process, including shape, size, location and distance. Directionality: Children need to know left from right because we read from left to right. This is how we follow a line of print- tracking. Watch for losing place, missing words, re-reading, back skipping (regressions). Do- tracking practice, using a finger or card or other pointer. Watch your student’s eyes when reading a line of print. Count the number of eye stops. Too many regressions slows reading fluency. Your goal is to lengthen the span, decrease the number of fixations and the amount of time of each. Being aware is the first and most important step. Improve eye-hand coordination by physical things such as playing jacks, stringing beads, juggling, ‘spearing’ cheerios, catching a ball etc. If kids complain of headaches, are squinting, tiring easily when reading, reversing letters or numbers, seeing words jump or move on the page, check this out with an optometrist or eye specialist. Not all kids have dyslexia. You may also look at the possibility of Irlen Syndrome. To improve directionality play Simon Says, give directions to follow, walk holding flashlights. Say “left, right” etc. Draw a map on the floor with masking tape and tell your child the directions to follow. 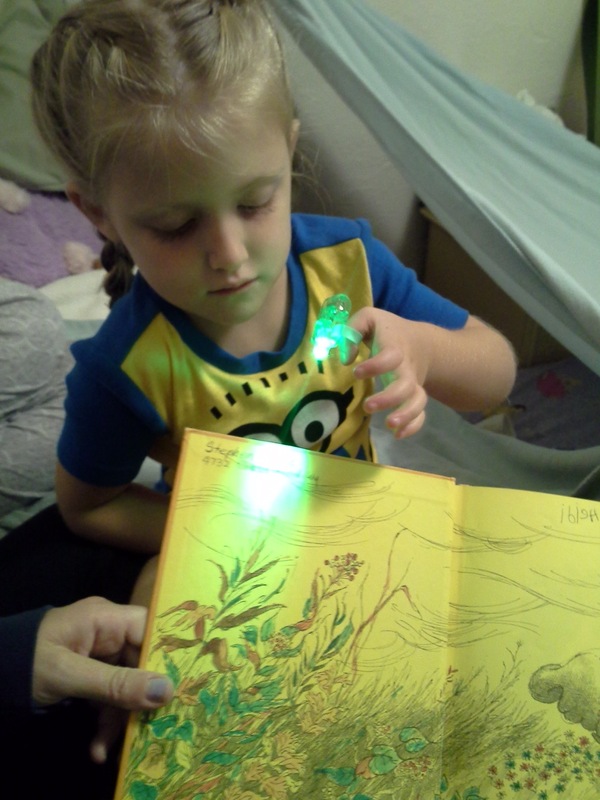 To practice tracking a line of print, use a flashlight such as the photo above, hold a bookmark or index card under a line of print, use a pointer, remind your child to only move eyes, not the head when reading. Reading is an emotional, physical and physiological process. It’s more than just a reading program. By modeling joy and love of reading, how to handle a book and read the print, you are giving your child a head start. Before you start teaching sounds and letters knowing there is a mechanical aspect to the reading process helps you better teach or assist your emerging reader! Be sure to check out my FB page for reading resources and motivation. See me on Twitter @RitaWirtz. I’d love to hear from you!